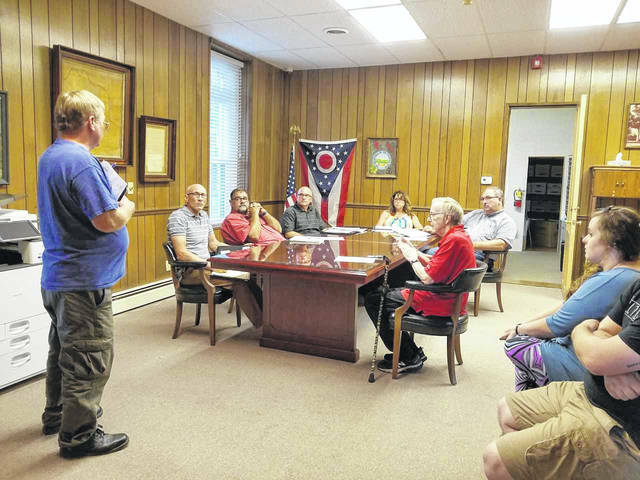 BELLVILLE — Honey bees were described as “bred for gentleness” and shouldn’t be the victim of anyone who wants to ban them, village planning commission members were told Tuesday night. But, they can cause serious problems for someone who is allergic, said David Duncan, an apiarist who spoke. The commission had heard before from Marlena Skeens, who said the effort of two residents to have bees in town could be fatal for her husband. The commission voted against granting a variance for keeping the bees to Devon Grennell and Andrew Granatir. 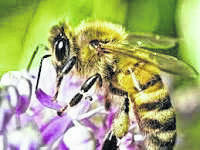 The two had also appeared at the most recent planning commission to plead their case for bee keeping. In this case, Skeens and her husband care. Commission members said they all love bees, and understand the bee population needs reinforcing. But Skeens showed the group a video of bees which have been at her house. She is the next door neighbor of Grennell and Granatir. The commission said the bee keepers could have 30 days to move the bees. Member Stephen Edwards said he thought they should investigate placing them with a farmer, or other landowner. Grennell said she understood the group’s decision. Duncan said he could help the two figure out the best way to move the bees. Duncan had suggested the bee keepers could construct a six-foot high fence surrounding the hive, and move it to the center of their property. He said bees fly out and then up and can go for a two-mile radius to forage. The problem with not allowing bees is “not realistic,” Duncan said. He said it is impossible to “Agent Orange” a bee population and to try to restrict them from areas where flowers and trees have luring blossoms. Duncan said he wants “peace and tranquility” but that he realizes people can have problems. Duncan said when he was younger he went into anaphylactic shock from a bee sting. Skeens said here husband doesn’t want to go outside, but that this week he did that to mow lawn, wearing long sleeves and long pants. She said he was stung twice, and that it takes 10 to 15 minutes to get to a hospital. After treatment for him it takes two to three hours to stabilize. Because it is “systemic,” it means if you are stung “you are just dead.” It increases the heart beat, which then stops, she said. Duncan approached the tricky subject in a diplomatic fashion, asking if her husband had consulted an allergist. He asked when the bee keepers had installed their hive, and was told it was in the last two months. Duncan also asked if anything had happened to Skeens’ husband in that time, and she said no. The bees “don’t care what we’re talking about,” said Duncan. The problem with not allowing bees to be around is that pollenation of vegetables and flowers suffers, he said. The bee population is now far less than it had been 40 years ago, said Duncan. Honey bees can get blamed for other insect stings, said Duncan. Yellow jackets are particularly aggressive if they see someone drinking a soda, or they find sweets. They change their eating habits from protein to sweets in the fall, he said. The commission is giving the bee keepers 30 days to move their hive. Smith said it is possible some type of legislation could be written to govern a situation such as this. There is no specific ordinance that talks about bee keeping within the village. This is why an application for a variance for this type of issue must be examined.